The cheaper, the better: Those with very basic needs are able to find a decent selection of laptops in the 400 Euro - price range. 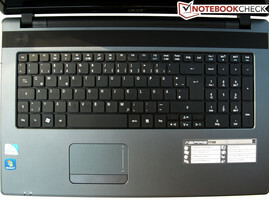 In this review we will determine if the Acer Aspire 7739Z, which starts at 375 Euro, is truly the bargain it appears to be. The Aspire family offers a variety of differently equipped models in various sizes. 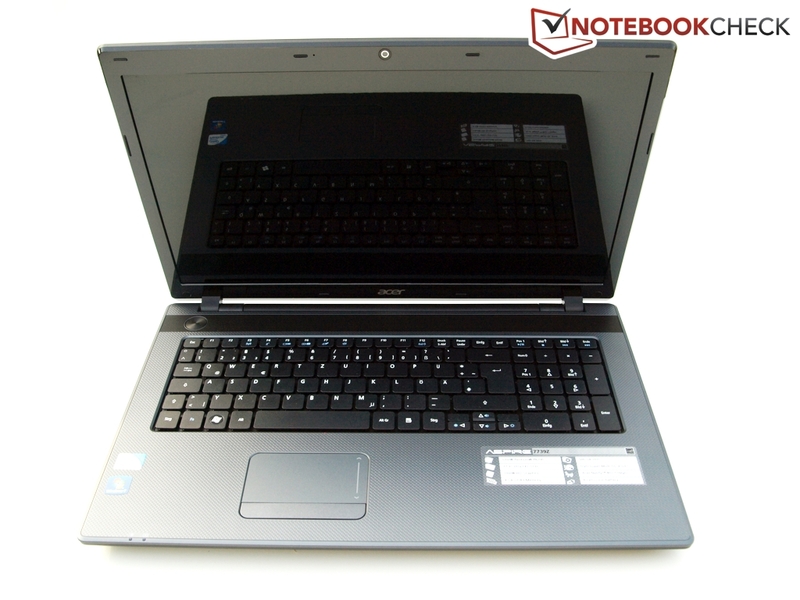 The 7739z is a 17.3-inch laptop at the lower-end of the performance spectrum. 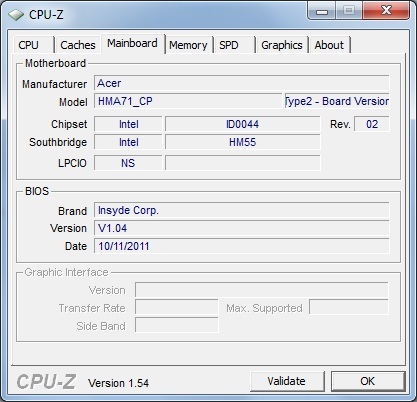 The system, which features an Intel P6200 processor and integrated Intel HD Graphics, has enough performance to tackle everyday tasks like internet browsing, office work, and videos - but unlike the Aspire members featuring a "G" in their name, it's not really suitable for more demanding 3D tasks (think modern computer games). 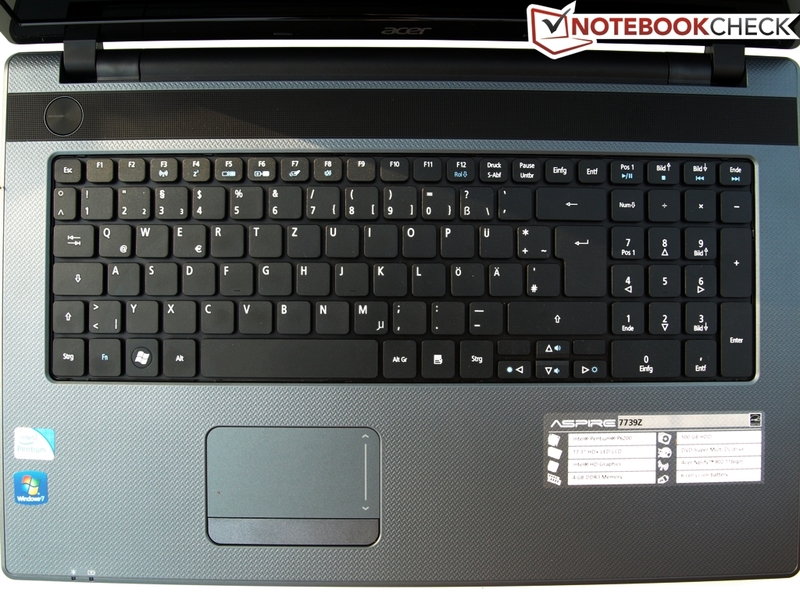 The exterior of the Aspire 7739Z is, except for the form factor, nearly identical to the 15-inch Acer-TravelMate-5744Z-P624G50Mikk. The black / charcoal gray chassis is made entirely out of plastic which is partially textured. The main unit appears to be solidly built, is resistant to deformation and torsionally rigid. Because of the size and weight (3.3 kg), the display doesn't really lend itself to being opened from the corner but it resists twisting surprisingly well. The screen handles pressure reasonably well; only a fair amount of force will cause a change in the picture. When we examined the Aspire closely, we discovered the same minor flaws that we noted when testing the TravelMate-5744Z: a few sharp edges and inconsistent gaps, especially around the display frame. Considering the size of the LCD panel, the display hinges are stiff and comparatively small which causes the lid to rock back and forth after it's been opened. Opening the lid one-handed causes the base of the laptop to lift up a bit. For a 17.3-inch laptop the connectivity options are fairly limited - something one should expect in this price range. On the plus side, both VGA and HDMI ports are included, allowing for analog and digital display connections. The built-in 2-in-1 card reader supports SD and MMC. Unfortunately the 7739Z only offers 3 USB 2.0 ports but no faster options like eSATA or USB 3.0 for transmitting data from and to external storage devices. 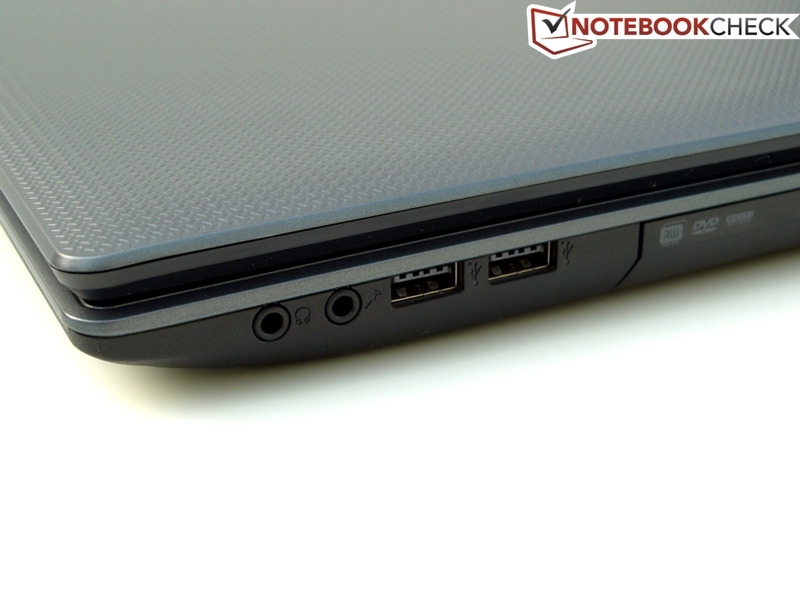 The placement of the ports towards the front of the laptop is less than ideal if they are utilized heavily because cables can get in the way. In addition, some ports (for example the USB ports on the right hand side) are placed very closely together. On the other hand all ports are within easy reach. The cabled ethernet connection via the Atheros AR8152 PCI-E Fast Ethernet Controller operates at 10/100MBit but not GigaBit speeds. Wireless connectivity to WiFi-Hotspots is provided by the Atheros AR5B125 Wireless Network Adapter (bgn) which also supports standard N. Bluetooth or an integrated broadband modem are not available. The low-resolution Acer Crystal Eye Webcam (640x480 Pixel; 0.3 MP) is adequate for video conferencing but not for more demanding applications. Included are only the most basic necessities like the power adapter, battery, and informational material like quick-start guide and warranty information. The user is responsible for creating a system recovery DVD as one isn't included. This task can be easily accomplished using Acer's eRecovery Manager. 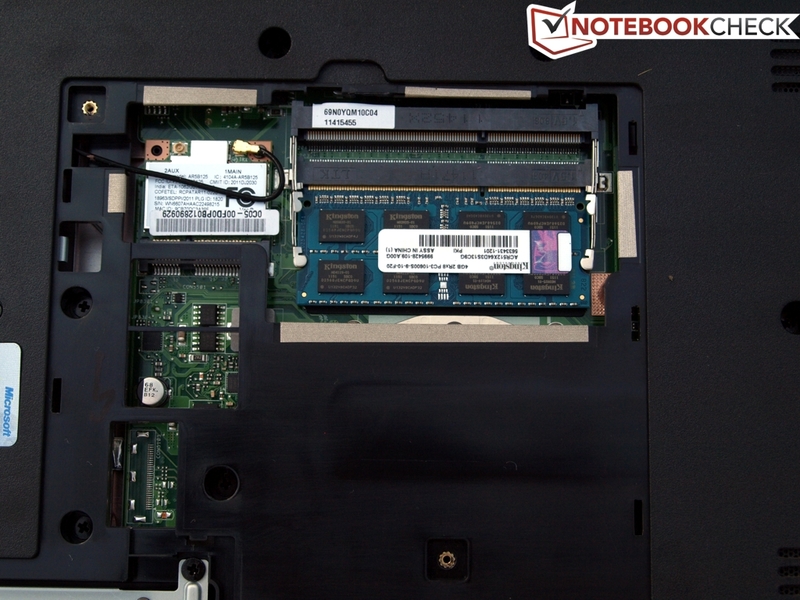 The covers on the underside of the laptop only allow access to the hard disk drive, the RAM module, and the WLAN module. 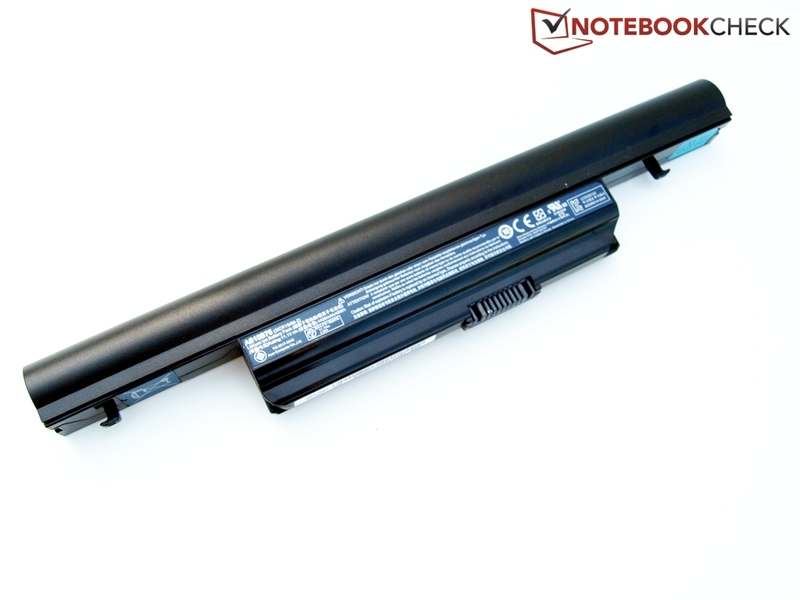 The battery is user replaceable but the laptop can be used sans battery without any issues. According to the Homepage, Acer offers a 2 year standard warranty for all Aspire models in Germany; the first year is ITW (International Travelers Warranty). The keyboard of the 7739z features a standard layout instead of a chiclet-design. The keys are sufficiently large and completely flat. They keys located at the front of the keyboard are a bit longer (deeper) than they are wide; the arrow keys are only half size. The keyboard doesn't flex under pressure and stays reasonable quiet. Typing was comfortable, thanks to the solid feedback, but the keys feel a bit loose when not hit dead center. 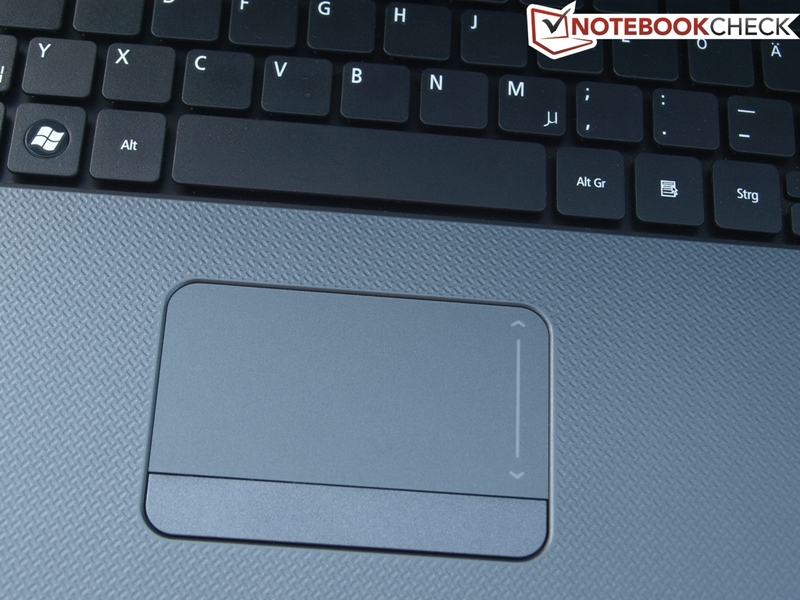 The very configurable Synaptics touchpad V7.5 is sufficiently large and features a comfortable, slightly textured surface which allows for easy movement of the cursor. Multi-touch features are supported; scrolling is also possible via edge motion. The left and right mouse buttons, which are hidden under a single bar, work well and remain fairly quiet. The display panel that Acer uses is the (LED-backlit) LG Philips LP173WD1-TLA4. 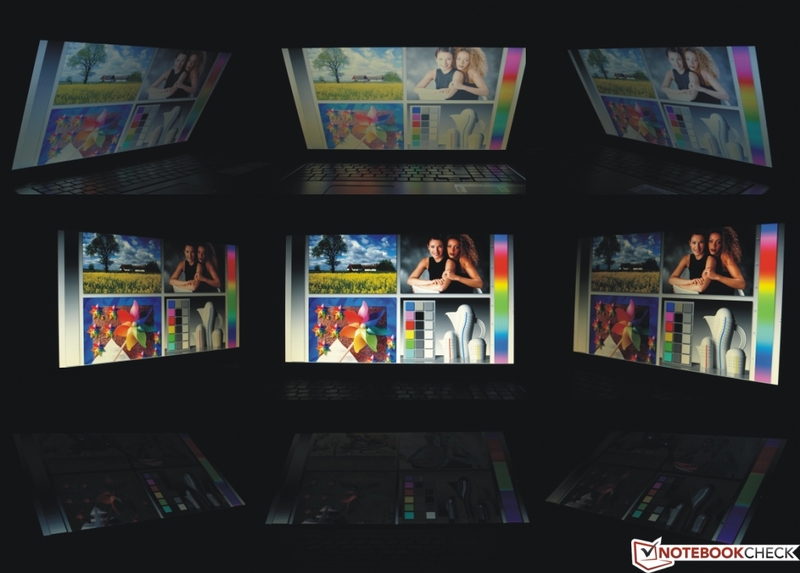 The glossy 17.3-inch panel features a resolution of 1600x900 pixel. The Acer-TravelMate-5744Z-P624G50Mikk features a non-glare type screen - something we think has its advantages, not just outside. Even though the display features a good average brightness-level of 231.3 cd/m², reflections are not always avoidable even indoors. The brightness distribution is OK at 88%, but contrast suffers due to the high black point of 1.2 cd/m². A black point value of less than 0.5 cd/m² would ensure deep, rich blacks in dark backgrounds and movie scenes. Not entirely unexpected in this price range, the display panel does not accurately cover either the AdobeRGB or sRGB color spaces. On the other hand, only professionals working with graphics or editing photos normally require coverage of the full spectrum. Colors appear vivid, and text is easy to read and sharp. Because of the good brightness levels of the display, using the laptop outside is not out of the question as long as as there is ample shade. 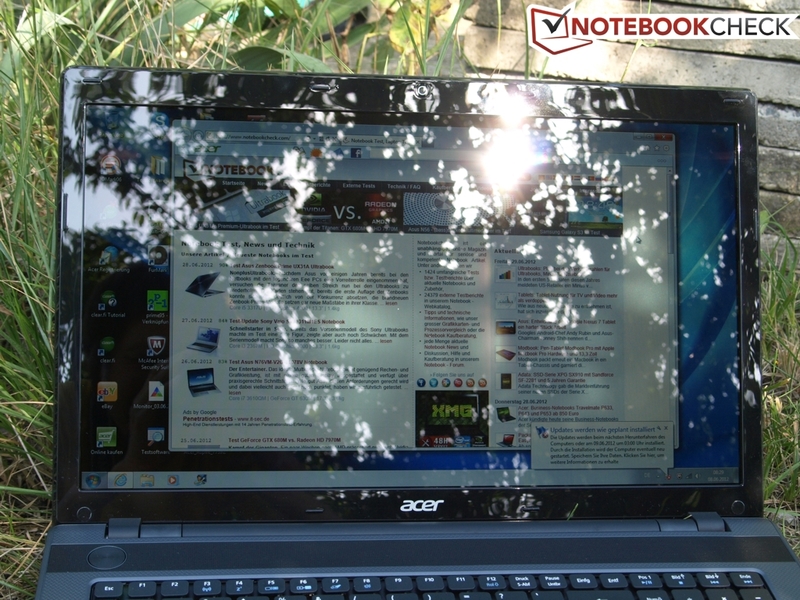 Because of the glossy screen, direct sunlight is best avoided as the screen is highly reflective. 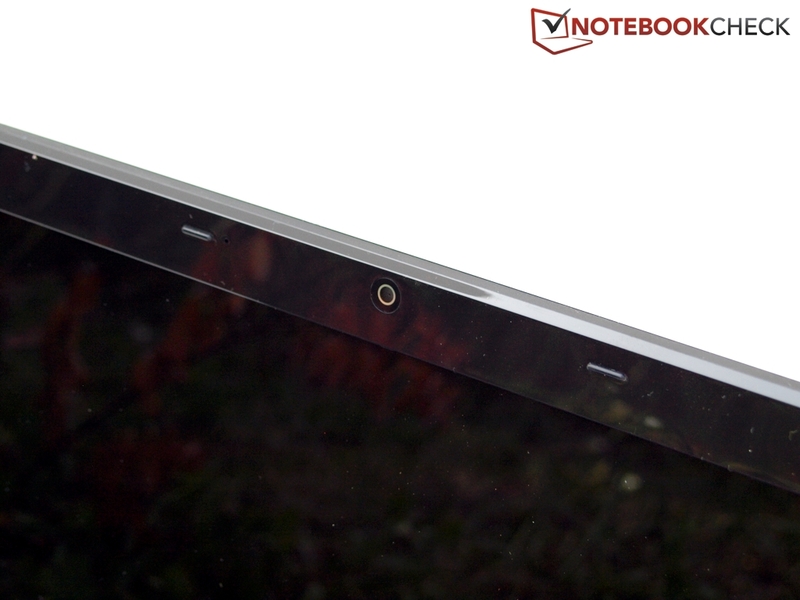 The viewing angle stability is about average for the notebook class. Reflections aside, horizontal shifts only happen at fairly extreme angles. Vertical stability is considerably less; viewed from above, color shifts are introduced fairly quickly. 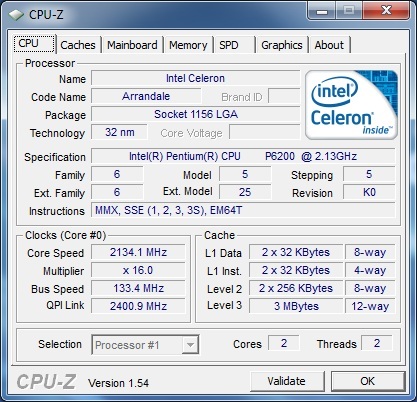 The Pentium P6200 is based on the (now two year-old) Arrandale architecture. 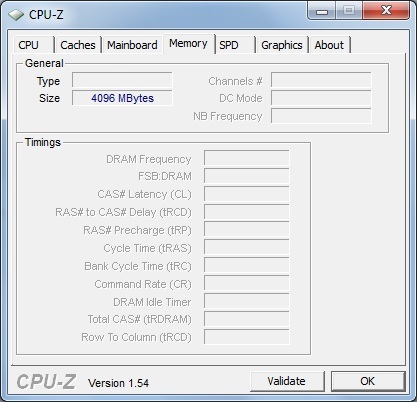 Potential buyers have to do without Turbo Boost or Hyperthreading. The P6200 integrates a DDR3 memory controller and the DirectX 10 capable Intel GMA HD Graphics, which runs at 500 MHz (Turbo up to 667 MHz). 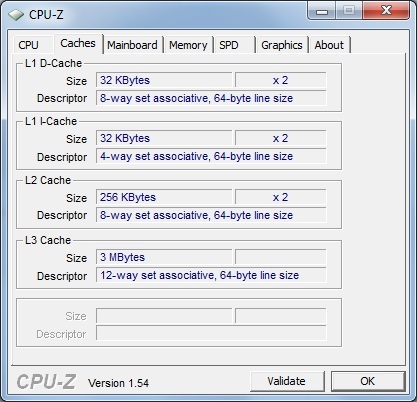 The 2.13 GHz dual-core processor has, according to Intel, a TDP of 35 Watts. Thanks to the 4GB of available RAM (1 slot) and the 500GB hard disk, the laptop handles normal office tasks well; for much more the hardware configuration just isn't sufficient. Subjected to the Cinebench R11.5 64-bit test, the 7739Z was only able to eke out a fairly mediocre 0.71 points during single-core rendering and 1.4 points during multi-core rendering. 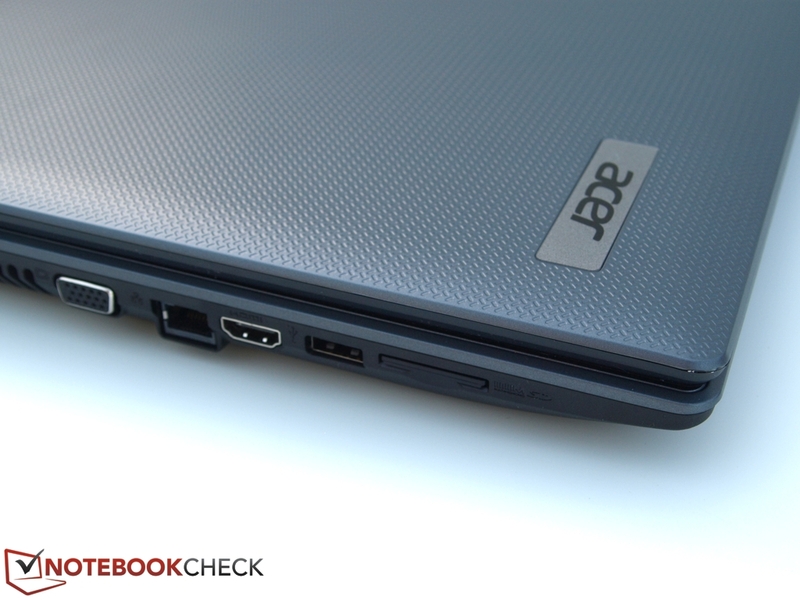 The results are in line with other P6200-equipped laptops though. Newer Core i3 entry-level processors offer quite a bit more performance. For additional information, check out our processor page; to compare other processors, take a look at our CPU benchmark comparison. The processor is capable of delivering full power even while running on battery. 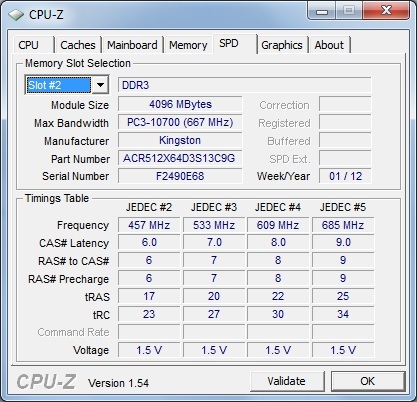 PCMark Vantage evaluates the overall system performance and its core components. 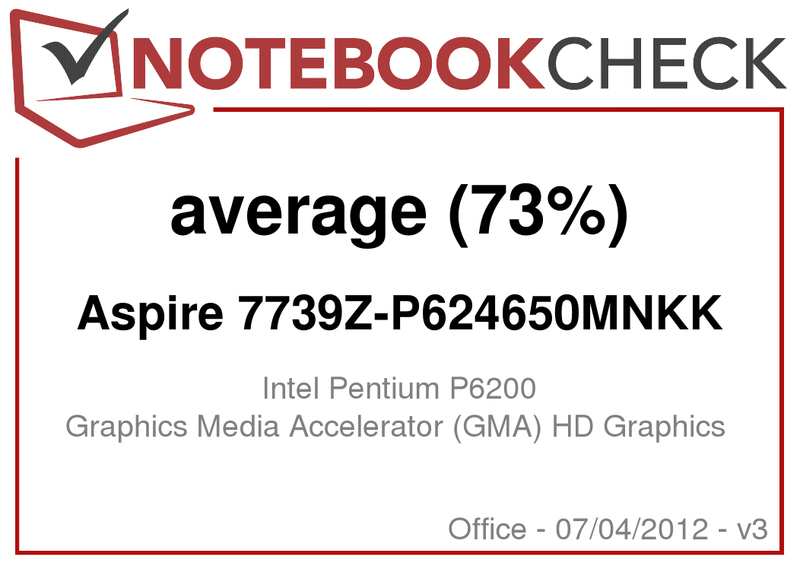 Our test system reached a score of 4357 here - since the laptop uses the same components as the TravelMate-5744Z, it shouldn't come as a surprise that the performance of the two laptops is nearly identical. Considering the hardware being used, this is pretty much exactly what we expected performance-wise. The hard drive the system ships with is a Western Digital-sourced Scorpio Blue WD5000BPVT-22A1YT0 spinning at 5400 rpm and offering a capacity of 500GB. The hard drive is partitioned: 13.5GB are assigned to the Recovery Partition; 452.16GB are available as the C: - drive for system- and user data. 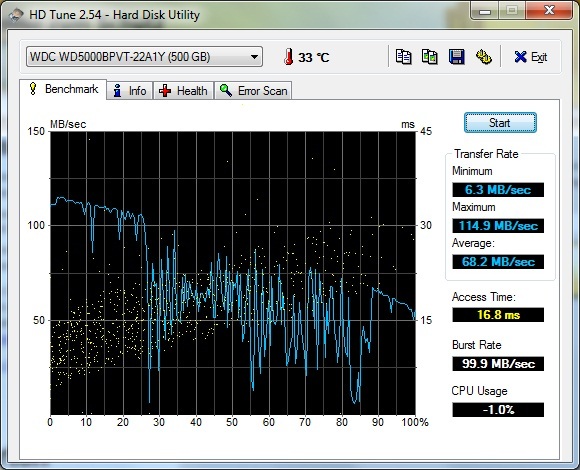 The benchmark results mirror what we've come to expect from 5400 rpm hard disk drives. Intels HD Graphics offer the manufacturers of notebook systems an inexpensive graphics solutions since the card is packaged with the CPU. The video decoder is capable of smooth playback of movies and trailer at 1080p; 3D-performance is extremely low though. The Acer reached 1567 points during 3DMark 06 - a fairly typical result for this kind of hardware. The graphics card can't handle 3DMark Vantage and errors out with a "std::exception Device removed". Considering the hardware specs, there is no doubt that the 7739Z is not a gaming system. Games with low demands on the hardware are playable though. We tested the (slightly more) taxing Diablo 3, and managed a not-so-smooth 20 fps at the lowest setting. We performed additional tests of various games during our review of the TravelMate-5744Z, which uses the same hardware. Our list of games shows the performance of various games using different graphics solutions. The fan rarely kicks in during system idle and is almost inaudible at 31.5 dB(A). Hard drive access noise increases the level to 33.2 dB(A). The high-frequency humming of the power adapter gets annoying after a while. Under load, noise levels increase to a value of 38.3 dB(A) which is still fairly quiet. When playing movies, the DVD drive is very audible at 40.2 dB(A). Our test candidate stayed cool during idle. As one would expect, the temperature increases under load - we measured 38 degrees Celsius (100.4 Fahrenheit) on the bottom, and 43 degrees Celsius (109.4 Fahrenheit) on the top, respectively. The hand rest remains cool to the touch. During full load, internal temperatures can reach 70 degrees Celsius (158 Fahrenheit) - still an OK number. The CPU does not get throttled - which is something 3DMark06 confirmed: the values after our load test are identical to ones we got during the "cold" system performance test. (-) The average temperature of the palmrest area of similar devices was 28.2 °C / 82.8 F (-4 °C / -7.2 F). The speakers are located above the keyboard. The maximum volume could be a bit higher but the sound remains distortion-free. We found the bass to be lacking - a pretty common scenario with built-in speakers. The 3.5mm audio jack functions without any issues. HDMI allows for digital transmission of audio signals. 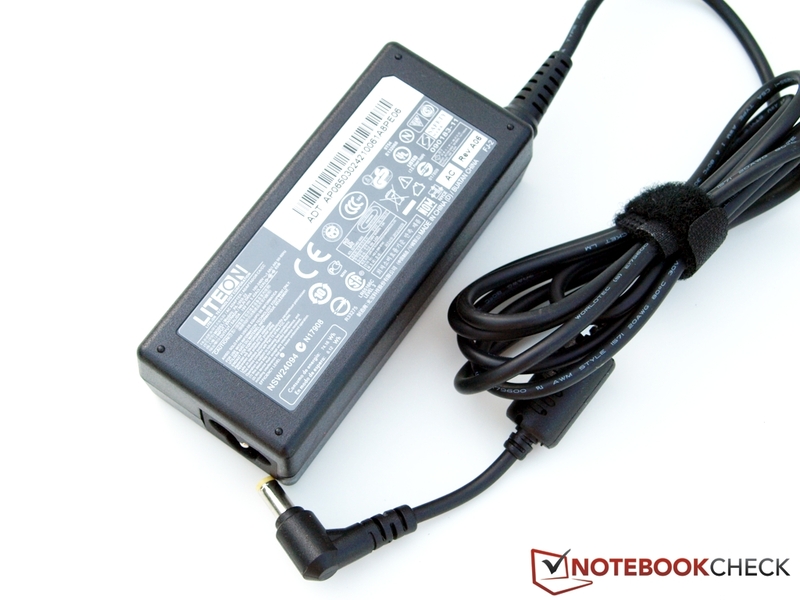 During idle, the notebook consumes between 11.3 and 20.4 watts which is in the same range as other systems like the HP 630-LH384EA or the Acer TravelMate 5744Z-P624G50Mikk. During maximum load, the 7739Z is the most power hungry out of the three systems - we need to consider though that the screen brightness is superior; the Travelmate also only features a smaller 15" monitor. The higher power consumption seems to be justified; and overall it doesn't seem to be too excessive. Compared to the more modern and significantly more powerful Sandy Bridge or Ivy Bridge architecture, this Arrandale-based systems seems downright archaic though. The 7739Z comes equipped with a 48WH lithium-ion battery - a similar capacity battery is included with the HP 630-LH384EA and the Acer TravelMate 5744Z-P624G50Mikk. Since our test model consumes more power, it's not surprising that battery runtime is the lowest of the bunch. For our BatteryEater Reader's Test, we turned down screen brightness to the lowest level, turned of WLAN, and chose the "energy saving" power profile. The laptop lasted for 270 min before shutting down wth 5% capacity left. 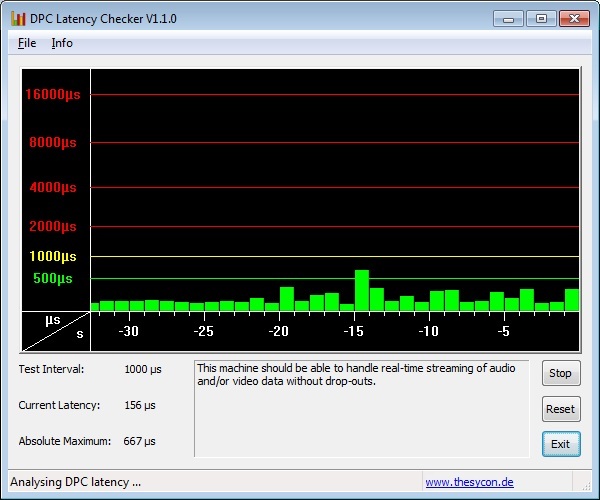 During the more realistic WLAN test, the laptop reached the 5% threshold after 92 min. We wanted to change the 5%-capacity setting to 3% but where unable to do so. You just can't expect too much from this value-priced 17-inch system. It doesn't have a lot of interface options and no fast ports for connecting external storage. The display is a glare-type and unsuitable for extended (professional) use. 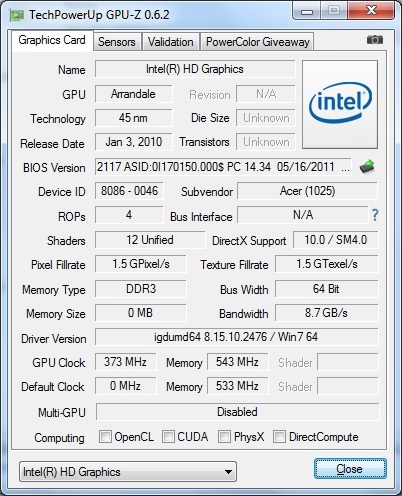 The hardware dates back to 2010 and is not sufficient to run demanding 3D games. On the other hand, performance is more than adequate for running office applications or internet use. Considering the price point, the quality of the input devices and the chassis is not bad at all and the display is at least bright enough. 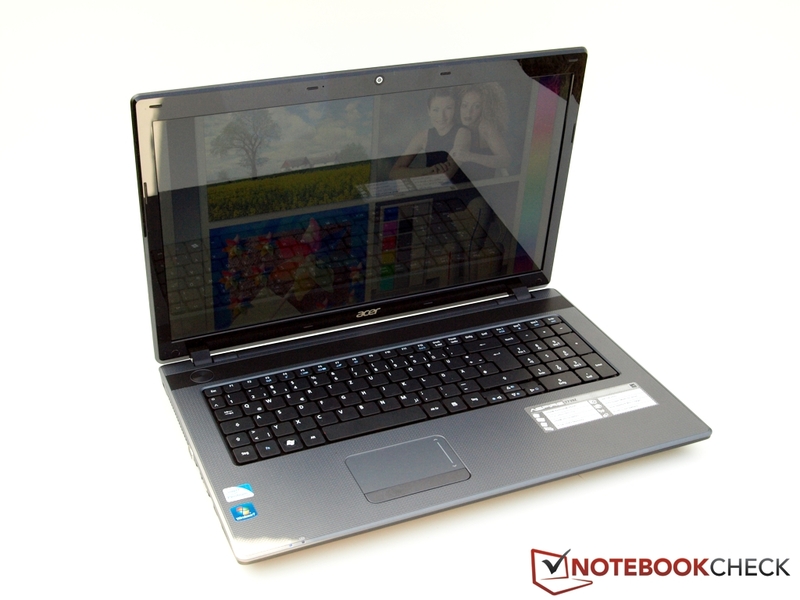 Target audience for the Aspire 7739Z is the value-conscious home user who doesn't intend to play games. This price bracket offers a never-ending supply of constantly updated systems - some utilizing more current hardware. Shopping around pays off - if 500 Euros is your upper limit, take a look at the (AMD based) HPs Pavilion g7 or Packard-Bell EasyNote LK11. There are quite a few value-priced systems available under 500 Euro. 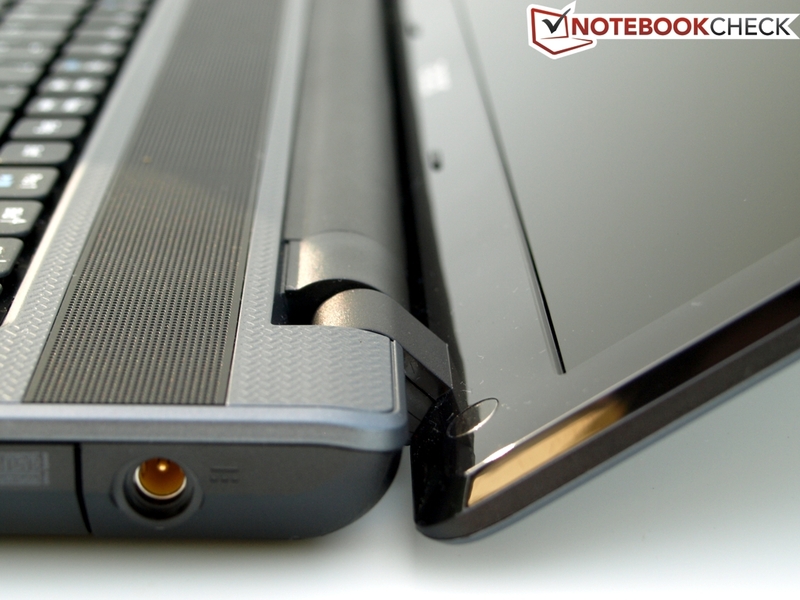 17" systems worth taking a look at are the HP Pavilion g7-2053sg and the Packard Bell EasyNote LK11-BZ-080GE. 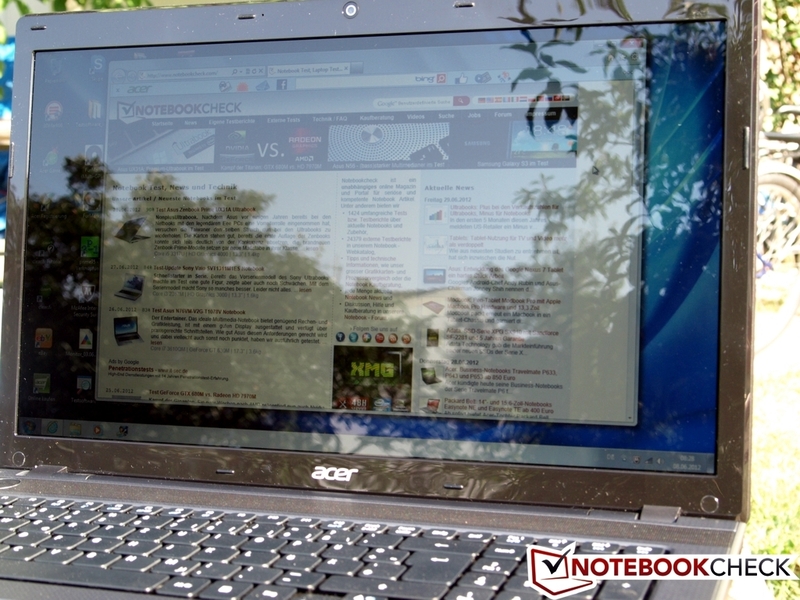 Note that these laptops differ somewhat so it pays to spend some time comparing them.